Biomass Drying | AIR TECHNIC s.r.o. AIR TECHNIC designs and supplies technological equipment for biomass (wood chips) drying in power engineering. The purpose of the technological equipment is to dry the biomass, respectively reduction of water content in biomass due to an increase in energy value (calorific value). Technological equipment for drying wood chips consists of a separate wood chips dryer and AHU for supplying drying air to the dryer and natural or forced extracting of saturated air from the dryer. 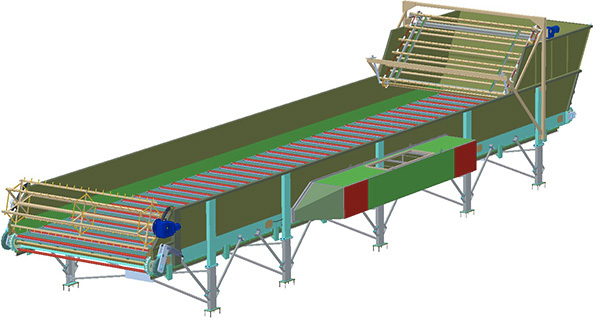 Continuous conveyor biomass dryer is designed to dry wood chips with 80-95 °C air using low-potential waste heat. Biomass dryers are designed to dry wood chips from 1.5 t/h to 6.0 t/h, depending on the volume of evaporated water given by the inlet and outlet moisture content of wood chips and the drying air temperature, respectively heat source power. Drying of larger volumes of wood chips is achieved by the parallel arrangement of dryers. The moisture content in wood chips at the inlet to the dryer up to 55%, the moisture content in wood chips at the outlet dryer less than 5%.